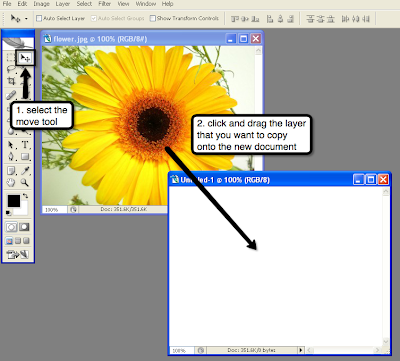 You can use the Move tool to copy a layer onto a new document. Choose the Move tool from the Tools panel. Select the layer you want to copy then click and drag it to the new document where you want to copy it to. To copy multiple layers, make multiple layer selections in the layers palette. To make multiple layer selections in the Layers palette, hold down either the shift key or the control key and click on the layers that you would like to select (if you're on a Mac, you can use either the shift key or the command key). Then from the layers palette, drag the layers onto the new document.